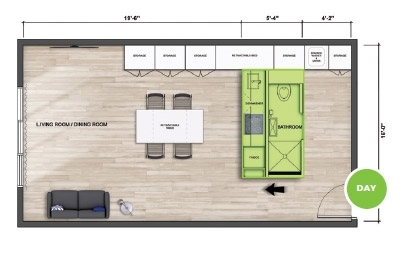 Move Home is the perfect solution for maximizing open-concept loft and studio spaces measuring 250 to 464 sq. ft. (23 to 43 m2). Moving the module back towards the living room allows you to create a nice bedroom and conversely, moving the module towards the bedroom allows you to substantially improve the living area. Moving the module towards the bedroom allows you to maximize the living area up to 170 sq. ft. (15.8 m2). Conversely, sliding the module back towards the living room allows you to create a 100 sq. ft. (9 m2) bedroom. 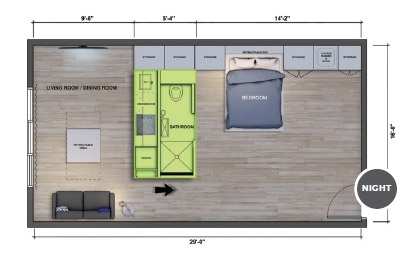 Moving the module towards the bedroom allows you to maximize the living area up to 312 sq. ft. (29 m2). 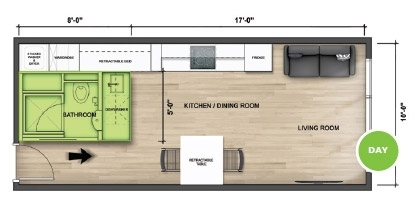 Conversely, sliding the module back towards the living room allows you to create a 226.6 sq. 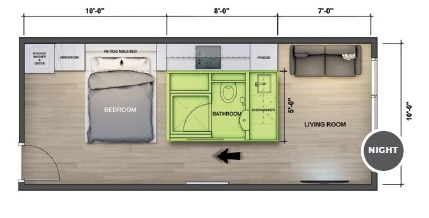 ft. (21.9 m2) bedroom.